The concept of network as a mathematical description of a set of states, or events, linked according to a certain topology has been developed recently and has led to a novel approach of real world. This approach is no doubt important in the field of biology. 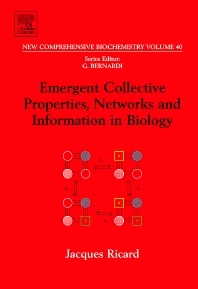 In fact biological systems can be considered networks. Thus, for instance, an enzyme-catalysed reaction is a network that links, according to a certain topology, the various states of the protein and of its complexes with the substrates and products of the chemical reaction. Connections between neurons, social relations in animal and human populations are also examples of networks. Hence there is little doubt that the concept of network transgresses the boundaries between traditional scientific disciplines. This book is aimed at discussing in physical terms these exciting new topics on simple protein model lattices, supramolecular protein edifices, multienzyme and gene networks.